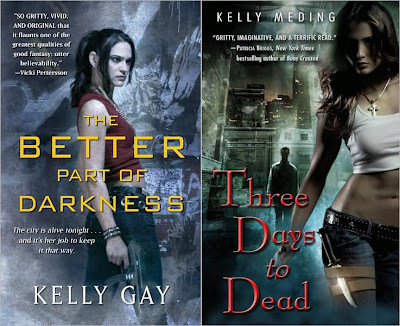 A reminder that Kelly Meding and Kelly Gay will be here tomorrow with a special guest post about their post-release debut experience. I'll also have copies of their books to giveaway. 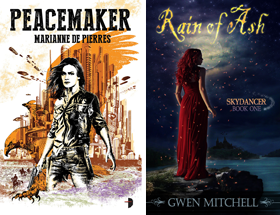 I'm running a little behind on my usual post so you can expect my December book release post to be out on Thursday. Be sure to check back on Sunday for the launch of the SFR Holiday Blitz where 12 bloggers have teamed up with 17 authors for your chance to win over 30 science fiction romance books. For a sneak peak visit The Galaxy Express or click the Blitz graphic below. 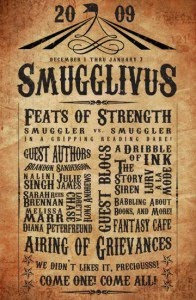 And of course today is the start of The Book Smugglers awesome month long Smugglivus extravganza. 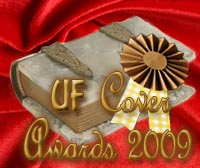 If you are a cover art lover like me you may want to enter the 1st Annual Urban Fantasy Cover Art Awards At All Things Urban Fantasy. Go vote! 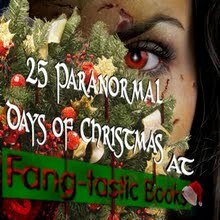 Roxanne Rhoads at Fang-tastic Books is running a 25 Paranormal Days of Christmas event with plenty of happenings. Ooh thanks. I didn't know about SFR holiday Blitz. And thanks for the awards shout out. Nearly 700 votes so far...crazy! Abigail your cover Event is going to have a HUGE turnout I am sure. Well done! Did you decide to forgo your monthly release post for December? I'm really missing it, it's the one post I look forward to on my RSS feed every month! Hi Angela its sitting on my workstation about 3/4 finished. Early next week I hope! Things this time of year have been very busy. I'm glad you find it helpful. Heck I need it myself to keep organized. Never fear it will appear. You went such a long time without posting (a few days) and then when you missed that post, I was worried about you. I totally understand being busy! Especially now.